NTRODUCING THE VEGAS LOW. WE LOWERED THE BIKE AND RAISED THE BAR AGAIN. 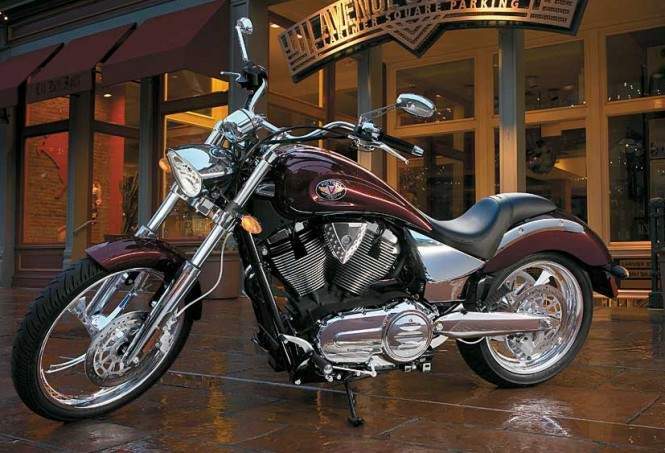 ITS SMOOTH STYLE AND LOWER SEAT HEIGHT GIVES IT A CUSTOM LOOK AND CUSTOM FIT, POWERED BY A 100 C.I. FREEDOM V-TWIN. Introducing the all-new Vegas Low™. With a long, low stance, it takes American cruiser comfort to a whole new level. 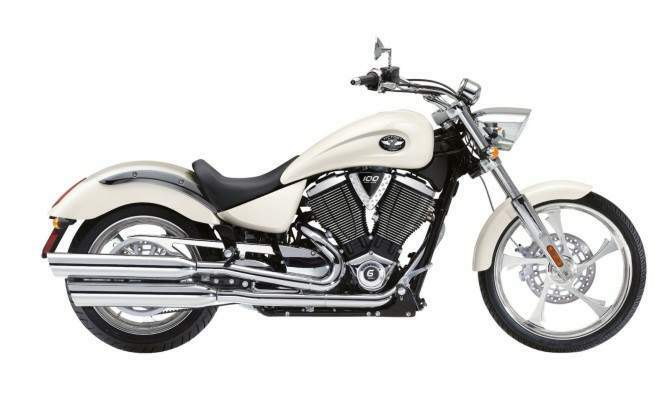 The frame is an inch lower than its namesake, the Victory Vegas®, plus the foot pegs have been repositioned and the bars have been pulled back by two-inches which makes everything just a little easier to reach. The modifications in design and engineering are subtle, but it’s a subtlety that ends in an extremely natural, laidback ride and a new high in American cruiser innovation and style. 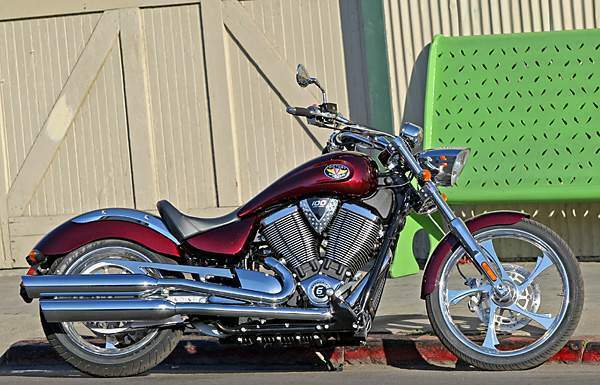 Lower seat height and narrower side covers - Seat height of 25.2" is over 1" lower than the standard Victory Vegas. Narrower side covers also provide a shorter distance to the foot pegs and the ground. Custom scallop tank - Along with its scallops, this tank features the Vegas Jackpot's signature raised spine that introduced a new ear in crusing styling. Adjustable front brake lever - Lets a rider customize the lever position to suit hand size and reach preferences. 2 pull back bars - The pull back sweep of the bars puts the grips and controls within easy reach of virtually all riders and complements the bike's flowing lines. Split tail fuel tank intergrated with seat - Seat provides the ideal combination of cushion and support and its front edge blends into the split tail of the fuel tank. Closed loop fuel injection - The closed loop injection system provides constant feedback and measured amount of fuel and air for a smoother, more responsive ride. 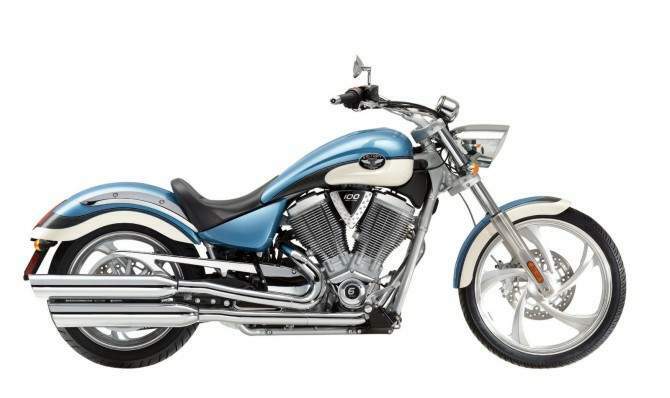 Freedom 100 Cubic Inch V-Twin engine - Re-engineered for 2008, this next generation, smooth, efficient 100 cubic inch (1,634cc) engine produces 85 horsepower and 106 ft-lbs of torque. Six Speed overdrive transmission - Re-engineered for 2008, it features a new quiet running, higher-ratio 6th gear, and lower ratio 1st gear improving drivability and acceleration. Footpegs moved 2.25" rearward - Foot controls - brake and shift lever - are within reach and are easy to operate for virtually all riders, regardless of inseam.